In a previous piece, I took on an article by Michael Lind published in the New York Times. Lind’s provided, “Trumpism and Clintonism Are the Future,” an analysis of the changes we are seeing today in both parties, and ultimately made the case that Bernie Sanders failed to change the Democratic Party or American politics. In Lind’s world, economic populism on the left is over. I argue that such a position misses the big picture, and misses it badly. Since Lind’s article came out, events occurred which, to some, may seem to support his conclusion: Hillary Clinton won the New York, Maryland, Delaware, Pennsylvania, and Connecticut Primaries. Furthermore, after her victory in the Empire State, several pieces surfaced like “”Bernie’s Failed Revolution by Bill Scher of Politico, and “”Berned Out by Sean Collins of Spiked, that essentially parrot Lind’s main point. Collins even went so far as to claim that Sanders’ message is “too pessimistic.” I imagine more of these echo chamber articles will follow Tuesday’s results. However, the naysayers are woefully incorrect, and their views limited. The outcome of the presidential primary, at this point, has very little bearing on the future of Democratic Party politics. Bernie Sanders may well lose the battle, but he has already won the war for the future. It all comes down to the youth. Of course, there is plenty here to quibble with in this reasoning. Namely, the flower children and hippy movement were never about progressive economic policies. Opportunity was at a high point in the 60’s in the midst of a boom cycle, largely thanks to the New Deal and subsequent reforms. The main issues for the hippies were social: Civil rights, women’s equality, the Vietnam War, and, to a lesser extent, Native American rights. On the other side, the southern realignment was also a realignment over social issues — a backlash against the reforms of the Civil Rights Era. Ronald Reagan, who completed this process by capturing southern white moderates, tied Milton Friedman’s economic agenda to the states’ rights narrative of the Southern Strategy. And so, the cultural shift away from economic progressivism was done under the color of a backlash against civil rights, and was barely noticed by most people. The hippies did allow this narrative change, but they never gave up on their issues. It is now 2016, and they’ve largely won — as Lind acknowledges. However, he misses the point that in this sense, their stances back when they were young really were indicative of the future. There is no reason to believe today’s youth will be different in this respect from their parents; they’ll hold on to their issue. Indeed, young people are driving a narrative change that will reshape American politics just as they did in the 60’s. It started when Barack Obama ran on a platform of “Hope and Change” in 2008. The left began to stir. Then in 2010, the Supreme Court gave the country the latest in a series of deregulatory decisions relating to campaign finance regulation which trace back to Buckley v. Valeo: Citizens United v. FEC. This decision was followed closely by a lower court ruling from the D.C. Circuit known as Speechnow v. FEC. Before anyone realized what had happened, super PACs were born, and money flooded into our political system. Then in 2011, protests broke out in Wisconsin over Governor Scott Walker’s plan to eliminate collective bargaining for public sector unions in order to allow him to unilaterally make up a budget shortfall at the expense of pensions, benefits, and pay raises. Next came the U.S. Uncut Movement, and of course, the Occupy Movement. These uprisings, while largely disorganized, began to change the public’s understanding of politics, and in 2012, Elizabeth Warren was elected to the Senate. That same year, Republican presidential candidate Mitt Romney was successfully beaten following a characterization by the Obama as a Wall Street crony capitalist. It is in this context we should view Bernie Sanders’ revolution against the oligarchy. 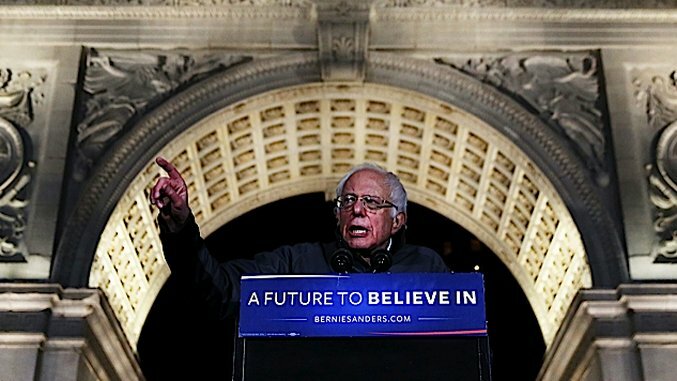 Sanders, who is running while receiving the majority of his funding in the form of small donations, and who is not coordinating with a super PAC, or taking money from special interests, is merely the next step for the fledgling progressive movement; its first real foray into electoral party politics. He has inspired his followers to run for Congress—to challenge sitting establishment Democrats in safe districts. This is how the Tea Party took over the GOP. And thus far, Sanders has been remarkably effective. Not only has he brought in many new voters to the Democratic Party, but what was once a coronation for Hillary Clinton has become a drawn out nomination process that has forced her to distance herself from the 90’s New Democrats, by adopting a more economically progressive message. It has become clear that this is the only way she can win the White House in November if she is the nominee. But the effects of the narrative shift are not limited to the left. On the right, the fervor has given rise to Donald Trump, who, like Sanders does not rely on a super PAC or special interests, and his brand of nativist economic populism. The establishment of the GOP has taken notice, and has adopted a more centrist tone on economic policy. Americans on both sides of the aisle are now tired of a government beholden to special interests that responds only to money. They want changes that transactional government and incrementalism cannot provide. Popular Culture is a vehicle for change. Perhaps the best indicator of this trend is popular culture. Words like “oligarchy” and phrases like “the one percent” have entered our political lexicon. Movies like Assault on Wall Street, Wolf of Wall Street, The Big Short, and the upcoming Money Monster as well as shows like Arrow and Mr. Robot that focus on the abuses of the wealthy at the expense of the common people, all feed the process. Just as Glee was indicative of a larger acceptance of LGBTQ equality, while simultaneously furthering that message, these movies and shows, and the new lingo portend the end of an era. Lind’s piece acknowledges that a change is happening, but he argues that we have already seen the “partisan realignment,” and now we are seeing the “policy realignment.” Essentially, what this means is that the demographics of both parties are a settled matter, as are the dominant policy platforms of both front-runners. While the idea of a two-part realignment is not new, suggesting that one of those parts precedes the other is an exercise in futility. Do partisan shifts drive party platform shifts? Absolutely. At the same time, do platform shifts drive demographic changes? Again, yes. This is the political science equivalent to the chicken and the egg conundrum. There is no reason for us to believe that the demographic shifts are done. As my colleague, Shane Ryan, pointed out: does anyone honestly expect a coalition between poor minority voters and rich, economically conservative, socially liberal whites to survive? Such an alliance depends on celebrity candidates, and is unsustainable. Sanders has captured the imaginations of these young voters, and he has brought many into the political process. In addition, he is also popular among independents and blue collar Americans. His supporters, like Trump’s, are more loyal to their candidate than the party. Bernie has met serious backlash from the political establishment. It is likely that 2016 is the start of a massive influx of these voters into the Democratic Party who are determined to never let the party leaders stand in their way again. On the other side, Trump too has a large following of voters who feel similarly to Bernie’s progressives on several key issues, and are facing similar opposition from their party’s establishment. These groups of voters are more loyal to their candidates than either party, and may eventually end up the same side. The ‘Bernie Or Bust’ movement has grown to a size that could sway a close race, and if polls are any indication, 2016 promises to be just that. A recent poll put Clinton and Trump within three points nationally, and RealClearPolitics’ polling average has her up by just 8.5 points. These truths should serve as red flags to those who, like Lind, believe the Democrats can remain pro-business if they stay socially progressive. Clinton cannot tack too far to the center in the general if she is to have any hope at securing victory. If anything, she will have to further alter her platform to win over a number of Sanders progressives—though, as she indicated at the recent town hall with Rachel Maddow, she is resistant to the idea. Then of course, if elected, she will have to deliver in a big way to overcome her increasingly negative favorability ratings, as well as long historical odds (the last consecutive two-term presidents from the same party were Madison and Monroe) if she is to win a second term in 2020. These facts alone are evidence that the “partisan realignment” is still very much underway, along with, and dependent on, the “policy realignment.” It is clear that if the Democrats make the mistake of embracing Clinton’s pro-business economic platform, we may even see the rise of a third party that will absorb their liberal base and many of Trump’s followers. This scenario would effectively be the end of the Democrats.